The first step to admitting you having a problem is to ADMIT that there is indeed a problem and that you want to get help. With that being said, "I am addicted to Christmas decorations." Ok, fine... "I'm addicted to buying every cute decoration, roll wrapping paper, wreaths, cards, etc." Ok. Ok? Ok! On my recent trip to Tennessee, I told you all that I bought a few hundred dollars in ornaments. Well...you think that would be enough for the holiday season right? Wrong! Last week I drove about 30 minutes to the closest Hobby Lobby. I told myself in the car that I was just going to look around and see what other things they had.. besides I was just really going there to get a mat for a frame. Hahahahaha. Yeah, I bought 30 bucks in ornaments in addition to the photo mat. So...this brings me to today. Hobby Lobby opened up a store only 15 minutes from my house. Oh how I love you Hobby Lobby. You have everything. I can walk in the store and buy anything from a calendar to birthday supplies to fabric. They tempted me with the 40% off coupon. I think I did well though...I only spent 20 dollars. Does anyone else love Hobby Lobby just as much as me? Or Christmas? Hobby Lobby is a hard habit to break. By the way I have tagged you in a post on my blog. Never fear that you're alone. I have my own Hobby Lobby addiction: the scrapbooking aisle. :/ It's going to be a rough one to break...should I ever decide to. lol. *LOVE* Hobby Lobby! If only I had enough money to feed my addiction! I have never been hooked on Hobby Lobby because it is too overwhelming for a non creative person like myself!! I have to agree... They need a 12 step program for places like that! I FREAKING LOVE hobby lobby!!!!!!!!!!!!!!!!!!!!!! i have actually never been to one. i dont think we even have one nearby. but ive heard great things about them! I looooooove hobby lobby, and I loooove christmas. I do not have a hundred dollars to spend on ornaments nor the place in our tiny apt. to put tooons of christmas decorations...so that keeps me from buying all the christmas stuff I want to buy. But if we ever get a house...WATCH OUT! lol. To say that I adore Hobby Lobby is an understatement. I have actually referred to it as Hobby Love on multiple locations. 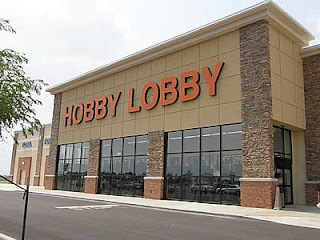 I am so jealous that you have not one, but two Hobby Lobby's so close! Hobby Lobby is a great place to get stuff. And I love that they always have a sale. It makes me very happy. Also, I think there is a Christmas museam/farm between here and Dallas. I saw they'd opened that new one and I was so excited! And did you buy a house? I love Hobby Lobby, the the closest one is 45 minutes away!! ;-( I love Christmas decor, but we have been going home for Christmas and I haven't gone too crazy with the decor any more! I love Hobby Lobby! I was so sad in NY because they only had Micheal's. omg we are so just alike. We dont have a hobby lobby close, but I LOVE decorating for Christmas!!! I put up 3 trees last year! Thanks to all the Hobby Lobby addicts, a university in my area is keeping their doors open. The owner donated lots of money to them, and he's overseeing how the money's spent. I looovveeeee Christmas and HobLob!!! ADORE Hobby Lobby and I miss it so. We live in Hawaii and there are zero craft stores. I miss it a lot.